Last August after only about a week and a half of living in Linton, North Dakota I came accross the Emmons County Chamber of Commerce booklet. I was at work in the Bayside Resort and brought it back to my tent to read about the area where Zeusy and I stopped our Missouri river trip. In the booklet was the Nokota Horse Conservancy. An organization founded by Horsemen Leo and Frank Kunz to preserve horses whose bloodline shoot right back to the horses once ridden by the great horsemen of the Northern Plains. I researched by Google and came across the website of the Conservancy. I became more interested and put a mental post-it note on top of the others to go and check it out first hand. Three days later a gentlemen walked into the Bayside Resort. 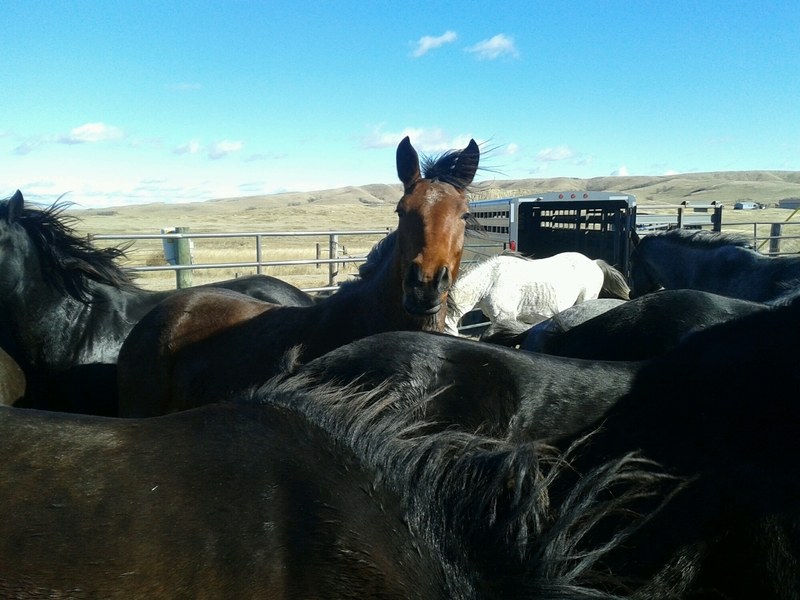 I walked outside and noticed Franks’ truck had a magnetic sign on it for the Nokota Horse Conservancy. I walked back in and told Frank I was interested in seeing the horses and maybe photographing them. Introductions were made and I realized I had just met one of the founders of the Conservancy. Frank Kunz. I told Frank of how I landed in North Dakota. He did a double take when I told him how I did it. I guess coming to North Dakota via a canoe is just not as frequent as it was in the 18th and 19th Centuries. It really hasn’t been for a very long time. I went back to my duties and about an hour later Frank offered me a place to stay in exchange for working at the Conservancy. I am not sure why, but I had a good feeling so I agreed to such an amazing offer. Many things came up including an almost month long return to St. Louis to try and help my dying father pass on peacefully and comfortably. I returned to North Dakota and was fortunate enough to have my friends Sammi, Sean, and their awesome kids Kole, Blaine, and Julia, and dog Blaze put me and Zeusy up for awhile until I was ready to work with the Conservancy. In no time I moved onto the Conservancy and Frank patiently took the time to train me to take care of the horses. It was fast because Frank was leaving to tour with the Nokotas on the East Coast to promote his life long work. 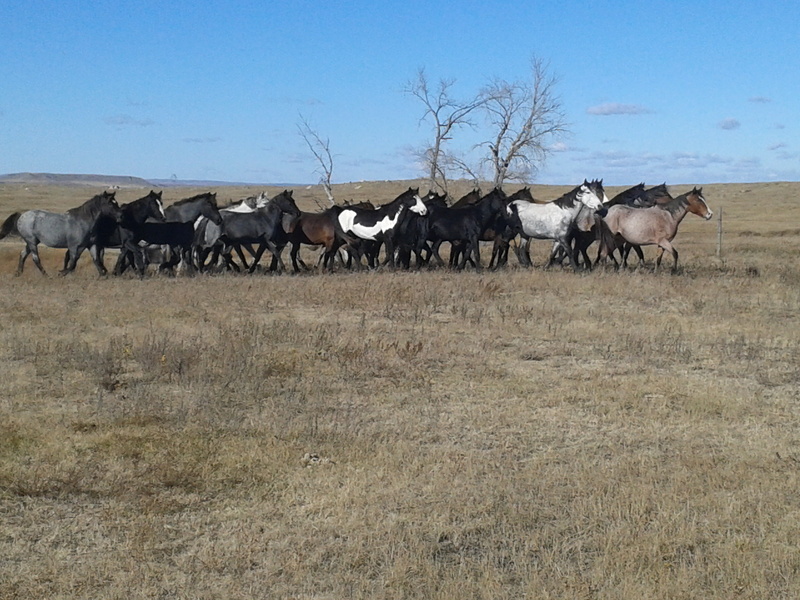 This included a roundup of 49 horses to move to a Winter pasture. And several hours moving one pile of manure to another pile of manure until I was comfortable enough on a Bobcat to learn how to feed the horses with it. Well the day came for Frank to leave and as the Sun was rising we were back at it. Cleaning the horse trailer and so on. Frank left to clean up and I later heard a very distinctive bird call. I looked up and saw about 300 Sandhill Cranes moving South for the Winter. Then I started thinking how the horses had been moved to pasture, how Frank was taking 10 horses to their new Pennsylvania homes, and how migration was in motion for the Sandhill Cranes. It seemed everyone was moving somewhere on such a beautiful North Dakota day and I wished for everyones and everythings safe travels. Then I realized that for the first time since the Spring that Zeusy and I were not traveling anywhere.At least for the Winter. Seemed strange and out of character. It has also made me grateful for all I have seen and done in the last several months. Especially being able to work for Frank Kunz and the horses he and his brother Leo saved. They are descendants of the horses of the great horsemen of the Northern plains. The Hunkpapa Lakota herd of Sitting Bull’s band. Surrendered at Ft. Buford, Dakota Territory in 1881. Holy crap ! Now that is amazing ! Don’t stop here! Click the link for more!